I rediscovered stamps while writing my honours thesis in 2003. I was studying history, and chose to write my thesis on the Australian Bicentenary of 1988. More precisely - without going into too much boring detail - I was writing about ideas of nationhood and identity as they were expressed through the official art exhibitions that were staged, both here and abroad, during that year. And that was a year of my life right there, peeps: up to my neck in slogans such as, "Make it Great in '88" and "Celebration of a Nation". Now, my thesis may have been less than groundbreaking, but the topic did allow me to look at lots of nice art in the process. 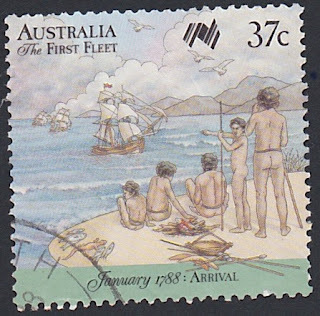 And while I was busy thinking about ideas about how and why we commemorate certain events, I thought of my dusty stamp collection from when I was in primary school, and remembered that there had been all sorts of stamps issued in the lead up to the 200th anniversary of the landing of the First Fleet at Sydney Cove. 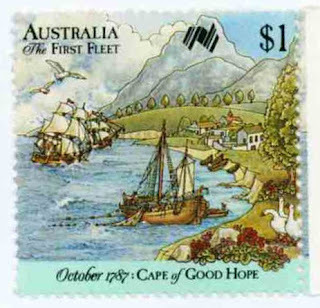 There were quite a lot of stamps issued for the Bicentenary, but the ones I remembered were the ones illustrating a panoramic scene across five stamps, for different stages of the First Fleet's voyage. 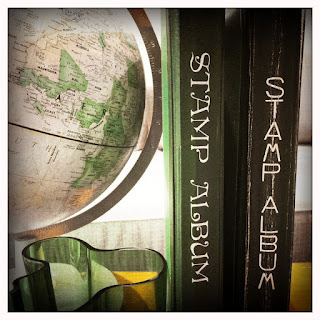 These stamps are not my favourite - but they did turn me into a philatelist (of sorts). 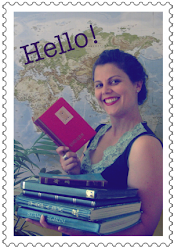 But it is possible that I was always going to be a philatelist. That it was written in the stars. Last week I mentioned Pa Bert on my Dad's side of the family. Well, last weekend I visited my Mum's parents, and Grandma Nellie gave me her two stamp albums full of the stamps she had collected during the 60s, 70s and 80s. So stamp collecting, it seems, is in my blood from both sides of the family. Grandma's albums are pretty great, and hold lots of treasures inside, which I am sure will be the focus of many a future post on this blog. And on the very last page of the second album of her stamps, I discovered Grandma had the mint set of Bicentennial stamps which kick-started my stamp collection. Yay! The Bicentenary, marking 200 years of white settlement of Australia, was in many ways politically fraught. It marks a beginning, but it also marks an end. While the landing at Sydney Cove is an event at the foundation of the society that I live in (and am thus grateful for), it marked a tremendous, distressing, murderous, grievous upheaval for the indigenous peoples of this country. The violence of that history is not displayed in this picturesque set of stamps that commemorates the voyage, rather than the colonisation. 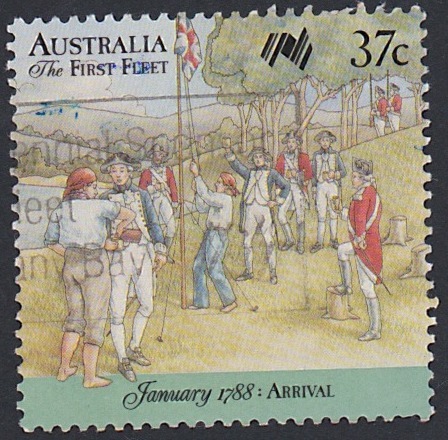 The story told in the stamps stops at the raising of the Union Jack. And to me that is interesting. What comes next is murky and hard to celebrate, so the story is chosen carefully. 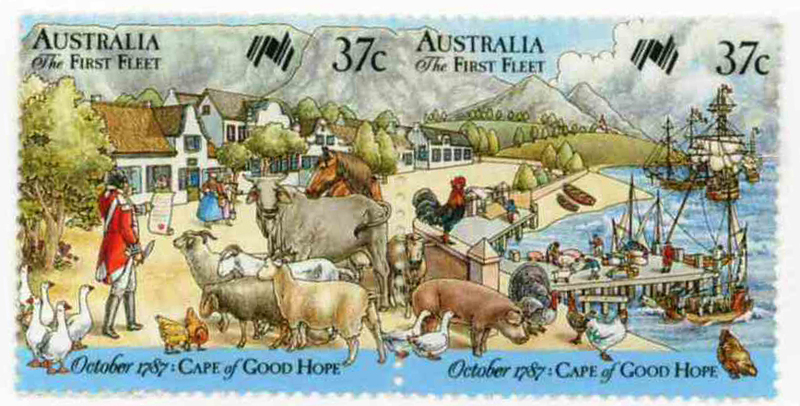 These stamps are every bit as much about 1988 as they are about 1788. Stamps as historic documents: I heart post. Grandma's mint strip illustrating "January 1788: Arrival"
I had the jigsaw puzzles that accompanied this stamp series. Picked up the first one "The Departure" from the Australia Post Pavillion at Expo 88 (to me that was the zenith of Australian cultural achievements). I think four of the five puzzles are still kickin' around my parents' place. That is so totally awesome Brook! 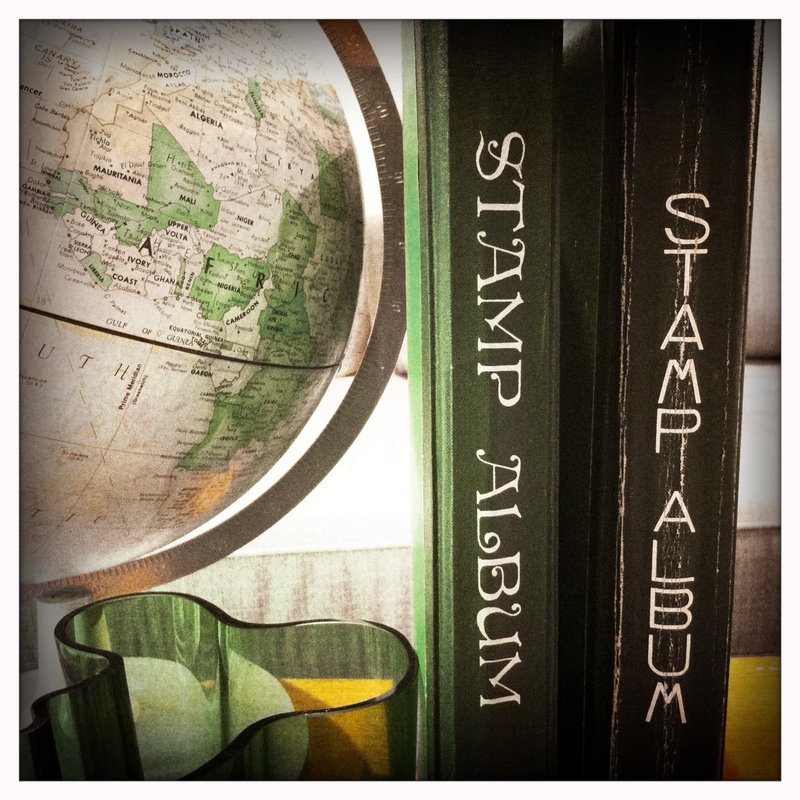 Awesome that a) you got to go to the Australia Post Pavillion and b) that you got a jigsaw puzzle of a stamp. I love jigsaws almost as much as I love stamps!